Casa Velas, an adults-only boutique hotel and ocean club in Puerto Vallarta, Mexico, introduces a new vegan/vegetarian menu heavily-influenced by its Mexican location this month to complement its wellness suites. Casa Velas, an adults-only boutique hotel and ocean club in Puerto Vallarta, Mexico, introduces a new vegan/vegetarian menu, heavily-influenced by its Mexican location this month to complement its wellness suites. Melding healthy eating with high Mexican cuisine, the carefully curated menu with dietary restrictions and preferences in mind is now available at the resort’s 4 Diamond restaurant, Emiliano, its ocean club and 24-hr suite service. The menus reinforce the hotel’s attention to guests’ wellness-focused needs which started with two 1,350 sq. ft. wellness suites that feature a plethora of special services and in suite amenities, from a custom soap selection and in-suite exercise kit to a personal wellness concierge. 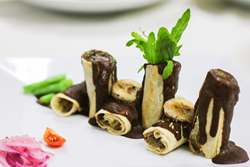 Complementing the new Vegan/Vegetarian Menu, last year Casa Velas unveiled two 1,350 sq. ft. Wellness Suites for guests looking to relax, reenergize and de-stress. In addition to a personal Wellness Concierge, the duplex suite comes with in-suite fitness amenities, such as a yoga mat, dumbbells, resistance bands, and even a Life Fitness Activate Series Recumbent Lifecycle® Exercise Bike. The Wellness Suites are equipped with a private plunge pool and rooftop Jacuzzi in addition to Manos que Curan soap bars, which are created from a combination of local Mexican plants, flowers, and seeds and are made for various types of healing. A Vitamin C Sprinkler in the suite shower lightly spritzes guests on command with a warm bath of vitamin C essential oils, which provide antioxidant and regenerative properties for the skin. Accommodations also feature a Nikken Kenko™ pillow, comforter, and LED Lamp with a clock and timer that increases gradually, simulating the dawn and dusk, which helps guests fall asleep and wake up more naturally. An Alchimia Apothecary Aromatherapy Kit, with scents ranging from cedar and lavender to tangerine and myrrh, affords the essential oils needed to experience total relaxation at night. A relaxing massage on their suite’s private terrace is included for all guests staying in the Wellness Suites. Rates start at $232 per person per night based on double occupancy. At Casa Velas, luxury accommodations, gourmet meals, premium liquor and wine, 24-hour suite service, use of the fitness center facilities, WIFI, taxes, and gratuities are included in the nightly rate. For more information please call 1-888-407-4869 or visit http://www.hotelcasavelas.com.